We have returned from Trek III safe, healthy, and still enthralled. This time we went due north of Kathmandu to Langtang National Park, Nepal's first Himalayan national park established in 1971. We combined three shorter treks to give us a route that kept us going for 19 days through the Langtang Valley, the alpine lakes around Gosainkunda and the middle hills of Helambu. At one point we were within six line-of-sight kilometers of the Tibetan border, and the trek ended within earshot of the Kathmandu airport. Thus, we like to think that we hiked from Tibet to Kathmandu, though in fact, it would have taken eight torturous days to cover the six line-of-sight kilometers to Tibet. Like the Annapurna Circuit, this was a trek where we had one porter and stayed each night in lodges. Often rooms were free, with the understanding that you would eat meals at the lodge. Most commonly available foods were potatoes and rice - boiled, fried, fried with cheese, fried with a mustard-green-like vegetable, fried with an egg, or some combination of the above. Omelets, chiapatis, Tibetan bread, and various momos rounded out the menu. It usually cost us about 7 or 8 dollars a day to eat, plus an occasional Snickers. Our porter/guide was AngNeru Sherpa, who had gone with us on the Dud Kunda trek. Every night he and Dana did an hour or so of reciprocal benefit English-Nepali lessons using a language book prepared for the Peace Corps. My job was to teach AngNeru "You are my Sunshine" and about 20 verses of "She'll Be Coming Round the Mountain." We would all practice singing together on downhill slopes. One of the most striking features of this trek were the mature, relatively undisturbed forests, by far the most impressive we have seen in Nepal - evergreen forests of fir and spruce that could have been in the Pacific Northwest, mixed forests of rhododendron, juniper, holly oaks, and bamboo. We saw a conifer over 6 feet in diameter and an oak nearly as big; we even found a nurse log with silver fir and rhododendrons growing out of it. Because of the steepness of terrain, we often walked through several vegetation zones in a day. Sadly, despite national park status, wood cutting for fuel is still taking its toll. The demands of wood for survival are difficult to deny. We also saw several troops of white, gray, and black Langur monkeys, including one group of about 25 at nearly 1200 feet below Langtang village. We spotted them coming down a narrow draw on the other side of a rushing stream and managed to intercept them where the trail crossed the stream. We had lunch and watched them for over an hour, often only 30 or 40 feet away - but on the other side of the stream. The monkeys finally departed by scampering up a 200-foot vertical cliff, mothers, babies and all, when six cross Yak/cows invaded their feeding territory. We also saw lots of beautiful birds - Nepal has 10% of the world's bird species. The most dramatic day of the trek began at Gosainkunda at 4:00 a.m. on November 28. I got up to pee (facilities outside), and it was snowing lightly. Gosainkunda is a pilgrimage lake honored by both Hindus and Buddhists, who gather there by the thousands during the August full moon. It is over 14,000 feet. When we crawled out of our frozen sleeping bags at 7, the ground was covered with snow and more was on the way. This was the first snowfall of the winter in these mountains. To continue our route we had to cross 15,200-foot Laurebina Pass. We were told that if we did not cross it that day, it might well be impassable the next. Despite plans to spend a leisurely day exploring around Gosainkunda, we set out for the pass after a quick breakfast. Searching for cairns and footsteps of those ahead of us, we crossed Laurebina in a snowstorm, nervous, cold and, exhilarated that we could do it. In the past 10 weeks we have trekked about 600 miles in 63 days. It is amazing that all of this has happened in a country about the size of Tennessee. (In order for you to view these pictures on the web rather than downloading them, my brother Whit has put these e-mailings on this website http://www.jackex.com/kathmandu.html). 1. 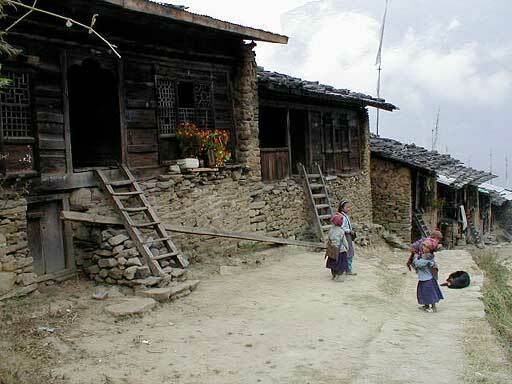 The Tamang village of Syabru, a day's walk into the trek. 2. 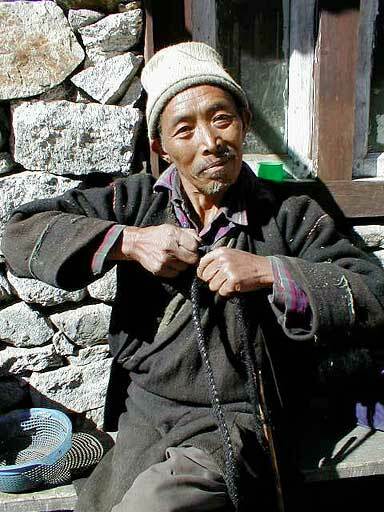 Man sewing together two woven strands of yak hair rope. 3. 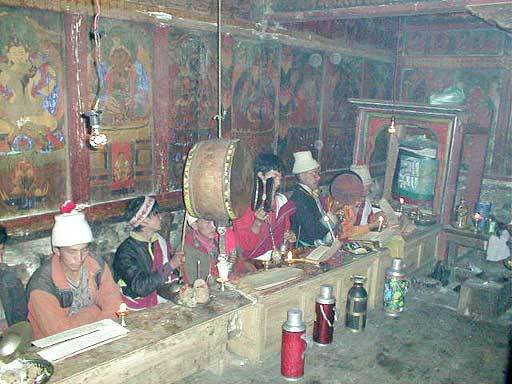 When we arrived at the village of Langtang, we learned that there was to be a three day puja at the gompa near there. 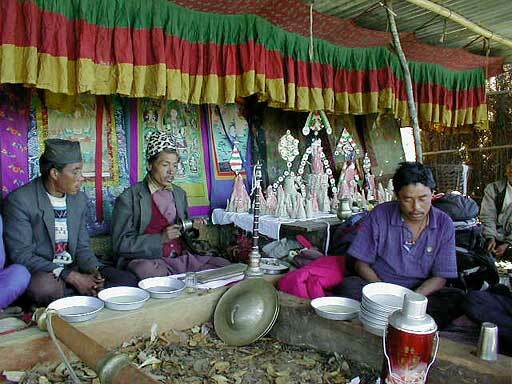 When we went the next day we were welcomed enthusiastically and urged to sit in a prominent place across from the lamas and monks conducting the Buddhist religious practice with chanting and musical instruments. A woman poured blessed water and then milk into our hands for us to drink. We shyly let it slip through our fingers. We were told that photos were ok.
4. 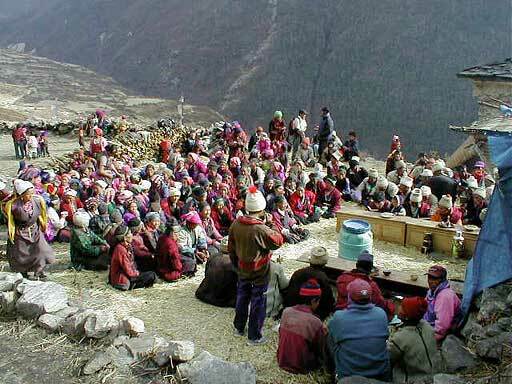 People from the village gathered outside the gompa to share a meal of dal bhat (rice, lentil soup, and a curried something). We were served like everyone else, and like everyone else ate with our hands, at least Dana did. Kids crawled all over us until I realized that one sitting on my lap was very wet in the lower parts. 5. 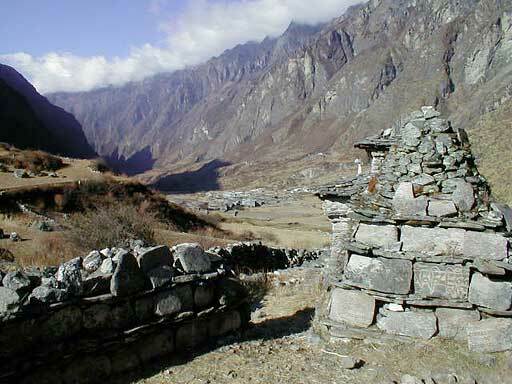 Above Langtang village a mani wall of carved prayer stones stretched for nearly a half mile. 6. This is Kenjin gompa with naks wandering down from the hill. 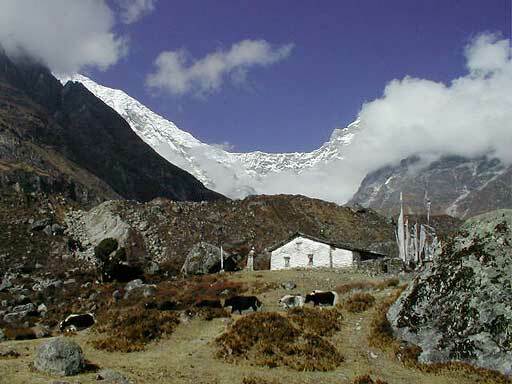 Kenjin gompa is the last habitation in the deep, narrow Langtang Valley that is bordered on both sides by ice peaks. One day we walked for 4 hours up the curving valley toward the towering peaks we thought stood at the end of the valley. As we made our way up the arc of the valley, new peaks appeared, capped by 7,000 meter Dorje Lakpa. 7. One morning at Kenjin gompa we got up early and climbed 15,900 foot Kyanjin Ri or Kyanjin hill. 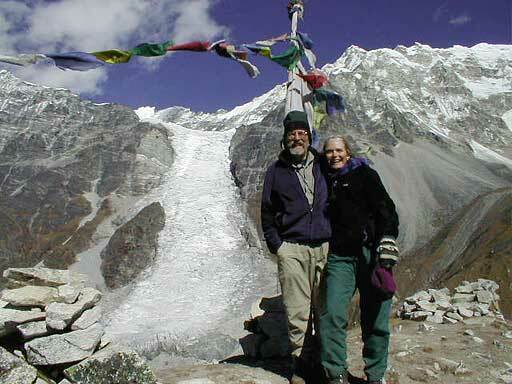 This is us on top with a waterfall like glacier behind coming off 7,200 meter Langtang Lirung. 8. 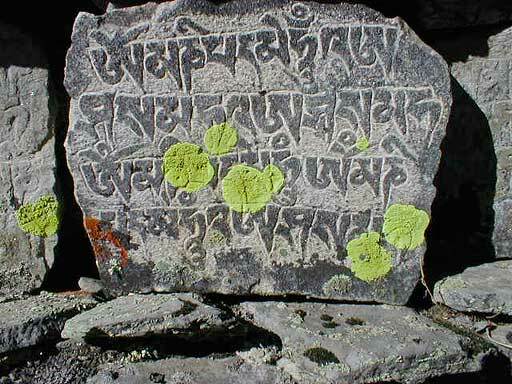 Mani stone with traditional Buddhist prayer Om Mani Padme Hum. 9. Mother weaving and children eating nuts we gave them. 10. 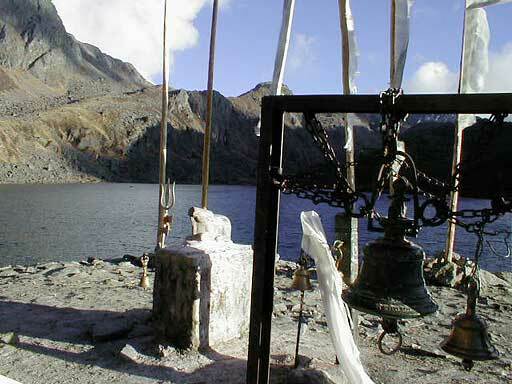 Gosainkunda with mixed Hindu and Buddhist symbols beside the lake. 11. 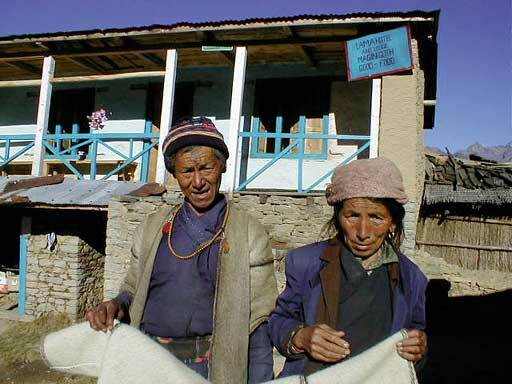 Lodge where we stayed at Magen Goth with proprietors holding a felted wool jacket like the one the man is wearing. We bought it for Dana for $21. 12. We took a layover day at Gul Bhanjyang in the middle hills to walk among the agricultural villages away from the main trekking track. Hearing the beating of drums and blowing of conch shells, we wove our way down the narrow terraces to what we thought was a puja at a gompa. It turned our to be a puja at a home for a 16 year old boy who had died. By the time we realized this, we were spotted by the people gathered below and beckoned to come ahead. A mat was laid out for us in the lean-to structure constructed for the occasion. Though only a couple of hours from the main trail, we could have been days away. The colorful items on the altar are made of nak butter. All of the men were drinking a strong homemade brew call raksi and laughed heartily when I declined a bowl. 13. 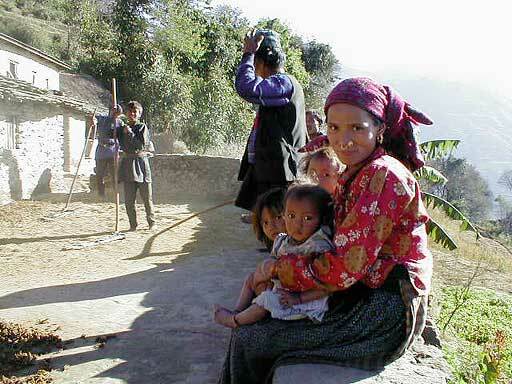 On the way back to Gul Bhanjyang we passed this family flailing millet to separate the seeds from the stalk. 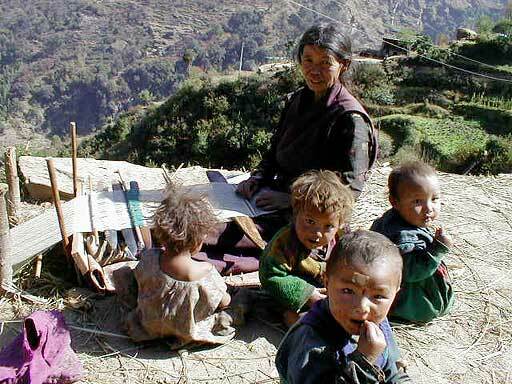 The woman wears typical Tamang jewelry, and has the all too typical brood of Nepali kids. 14. We developed a fondness for makki or Napali popcorn after being introduced to it by porters on the Dude Kunda trek. It was never on a menu, but a couple of times we were able to instigate a popcorn production. With AngNeru, we walked up and down the short and solitary street of Gul Bhanjyang asking at each home if people had dried corn. Finally, this woman said yes and offered to sell us about a dozen ears for about 50 cents. 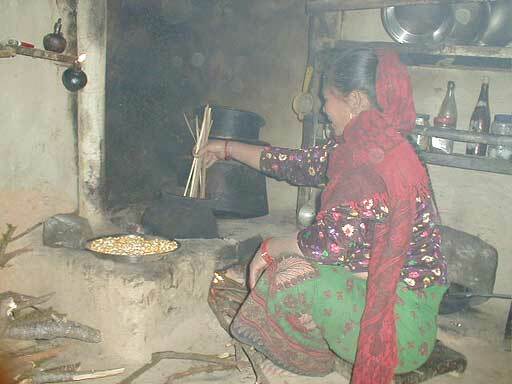 When we agreed to the deal, we didn't know it included her taking the corn off the cob and popping it for us while she tended the fire and three children and we sat for an hour on the dirt floor of her kitchen. The corn really doesn't pop into a fluffy white morsel, but rather swells and splits like the very best pieces at the bottom of a bowl of USA popcorn. We miss home and all of you but wouldn't trade this experience for a Bellingham winter.